Great with Children and Seniors! Call (623) 640-7880 now to get on our waiting list (no commitment until deposit). As of May 2, both Sugar Bear and Heidi have been bred, and we are waiting to see if either or both of them "caught." We should know in a week or so. Visit our Facebook page for the most up-to-the-minute news. We currently have a waiting list for our litters; if you are interested, please call us today at the number above to reserve your position. Because we can't offer puppies every month, many folks simply drop off our list; so new prospective families have a very good chance at any upcoming litter. Please enjoy the following "photo tour" of our breeding philosophy, and sample photos of some of our Ranch's earlier puppies! Today was Ruby's first hunt. She did an unbelievable job for a 14-month-old puppy. She jumped and retrieved these four pheasant and just made my day. I have had a few good dogs and some great ones in my life, but Ruby is the best at this age. She is calm and easy to work with. My brother and his family brought me along to help them choose a puppy with the best temperament. 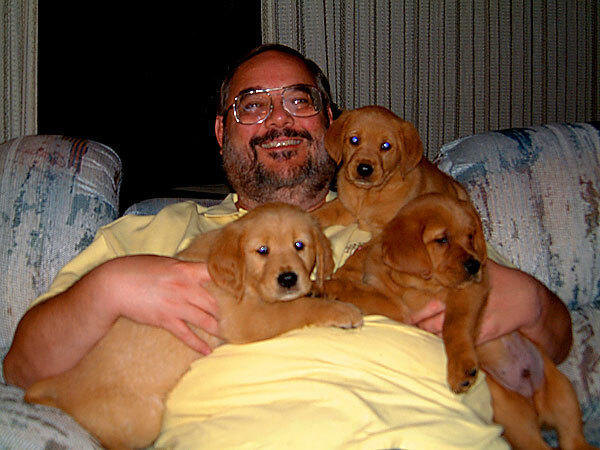 At the end, I had to tell them, "You can't go wrong with any of these puppies—they all have wonderful personalities." Kimber is the calmest, most wonderful gentleman you would ever want to see! George and Heidi are both potty trained and have willingly accepted being King and Queen of their respective homes. Heidi goes with me wherever I go, and always looks forward to it. We are just absolutely enjoying the heck out of these pups. Faith is probably one of the most intelligent dogs I have ever trained. You show her once and she gets it! Yesterday, I was out running errands and was gone for a good four hours… When I got back, she greeted me at the door with my other two Goldens. Needless to say, she knows how to open a crate. Amazing! You certainly do breed a rare pup! Nash slept all night long. In 24 hours, he has only made two small piddles indoors, and he's already mastered the doggy door. Unbelievable! Opey is thrilled with Nash. He's even letting him play with his dog toys. I was extremely surprised at how well they got along. He's now sleeping at my feet. We couldn't be happier! 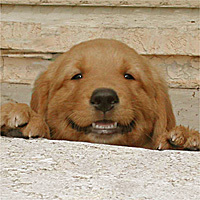 I hope you're still breeding these puppies when the time comes for me to get another dog, because I want one of yours! Our puppies enjoying(?) their first wading experience at five weeks. We breed our puppies with love and personal attention. All our puppies have been raised by our family on our Ranch. Each one has been handled, cuddled, carried around with us, and thoroughly imprinted to be people-oriented. Our puppies are family-friendly and very loyal; hardy and healthy; great swimmers and fetchers; and generally very calm, happy dogs. 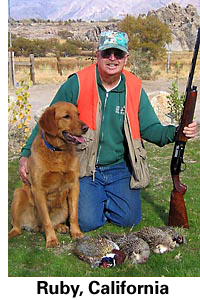 They have good hunting and retrieving instincts, and with appropriate training would make great hunting companions. Our puppies may be reserved at any age, but we keep our litters with their mother until the age of eight weeks. Our fee includes all appropriate immunizations and vet checks to eight weeks. 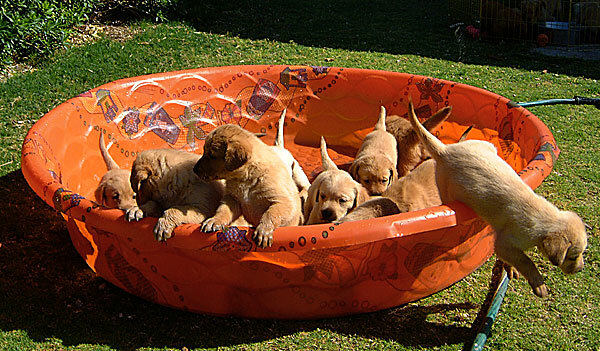 Puppies who come of age in warmer months are introduced to swimming in a stress-free manner designed to eliminate fear of the water, promote the puppy's confidence in his own swimming ability, and teach the puppy how and where to exit the pool easily. We screen our recipient families conscientiously, and try to match them with puppies with the temperament and personality they desire. We observe how our recipient families interact with our puppies. We will not sell or ship a puppy to a buyer we have not gotten to know. We enjoy keeping in touch with our puppies' owners, hearing about their pets' lives and accomplishments, and receiving photos. Many of our new owners hear about us through word-of-mouth from other satisfied owners. To us, these puppies are extended family. 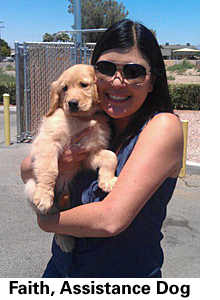 We have matched puppies with new families from California to New Hampshire, and Alaska to Mexico. Buyers traveling long distances can often spend the night right onsite at a Ranch facility, depending on availability. Our puppies go quickly. If having a choice of coat, color, and personality is important to you, please schedule an early visit to place a deposit on the puppy of your choice. Transportation info: Air travelers should be advised that puppies of these breeds are often too large to fit in under-seat carriers by eight weeks, and because of our desert temperatures, airlines departing from Phoenix Sky Harbor will not accept animals in their baggage compartments between (roughly) May and October. We will release puppies at seven weeks to accommodate air travelers, and strongly recommend use of a soft-sided under-seat carrier. Check ahead of time with your chosen airline, because each airline has its own rules, and a few do not accept animals at all. 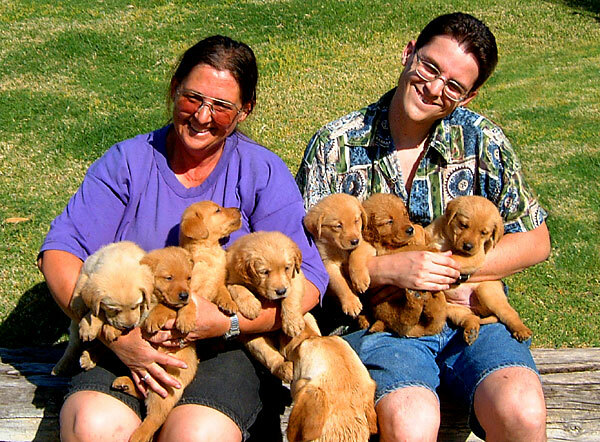 A portion of Heidi's litter at five weeks. We specifically breed this mix of Golden Retriever and Yellow Labrador —America's top two favorite breeds —because we and many other people find them appealing. 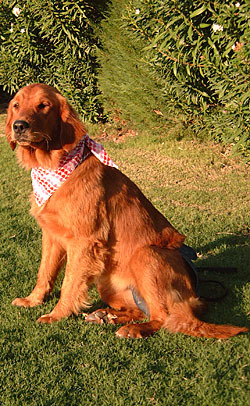 With shorter coats than a purebred Golden, they require less grooming and shed less. We have heard the following tale many times over: "We had a mixed Golden Retriever/Yellow Lab for years, and he was the best dog we ever owned. He was smart, gentle, and great with the kids. Recently, we lost him to old age, and the family was really hit hard. Now that we are searching for another dog, we looked all over the web to find anyone who intentionally breeds this mix, and you were the only one we found." Service-dog agencies are switching to this mix, in search of the particular intelligence, temperament, hybrid vigor, and easier maintenance afforded by these beautiful dogs. 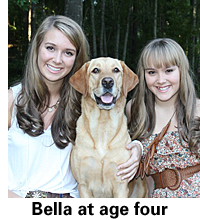 Luke, Heidi, and Sugar are Golden/Yellow mixes from pedigreed, purebred Golden Retriever and Yellow Labrador stock. Honey and Sandy are both purebred registered Golden Retrievers. 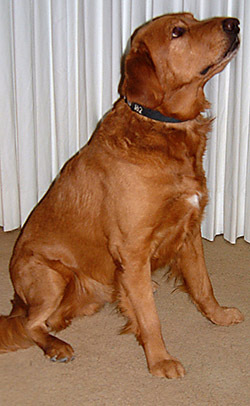 Fergus (1997-2011), founded our breedline. 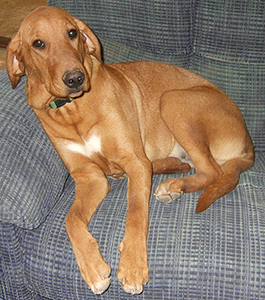 At a strapping 98 pounds (none of it fat), 27" at the shoulder, with a block head and fox-red coloring, Fergus was a "leg-leaner" who loved attention. Born to pedigreed parents in Massachusetts, he was with us all his life, and travelled cross-country in our RV nine times. Heidi (born 2004) is 75 pounds, 24", ruggedly built with a blocky head, and obviously favors her Lab side. A first-generation mix born to pedigreed parents in North Phoenix, she is extremely bright (she opens sliding doors! ), goal-oriented, and is an enthusiastic swimmer and diver, actually snorkeling after toys. Heidi produces a typical litter of eleven playful, lively, medium-large pups, and has assumed the role of conscientious nanny to everyone else's litters. Our current breeding male, Luke, is strong, healthy, and playful at 95 pounds, 27" at the shoulder. Born January, 2004 at the Ranch to Fergus and Tracey, our original breeding pair, he is a second-generation mix. 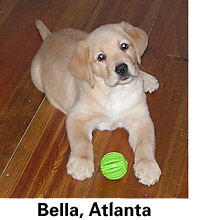 (Yes, the photo at the top of our page is Luke as a puppy.) He has his dad's fox-red coloring and his mom's Golden-style "feathers" on legs and tail, plus a beautiful white blaze. He is a happy-go-lucky "leg-leaner" who loves attention and is very eager to please. Liberty Haven Honey Bear ("Honey"), has been registered as a Therapy Dog. She is loving, mellow, and obedient. Born July 2004, she has been at the Ranch since December 2004, coming to us from Virginia. 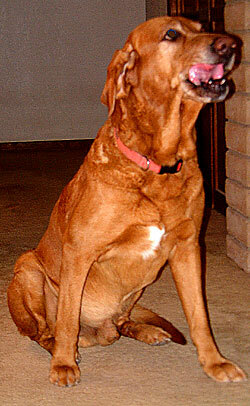 She has a flowing red golden coat and boasts a champion ancestry. Though Honey no longer has litters of her own, she is an enthusiastic nursemaid and nanny to our other girls' broods. An avid TV-watcher, she enjoys informing us whenever a dog appears onscreen. 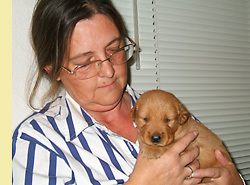 Sandy is a blonde, papered Golden Retriever, born in July 2007. She came to our Ranch in February 2010. She's a bit more petite than our other girls, weighing in at 60 pounds, and she stands 22" tall at the shoulder. 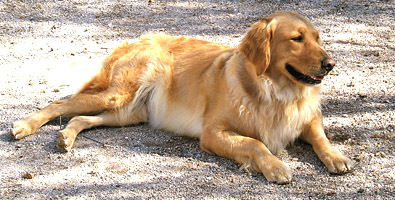 She has the hallmark full-flowing coat and feathers of a full-blooded Golden. Typical of the breed, she is very friendly and gentle, loves attention, and dotes on approval. Sandy is a fanatic fetcher and swimmer, and will cruise the pool endlessly without touching bottom or tiring. She is an experienced and attentive mommy, and produces large litters. 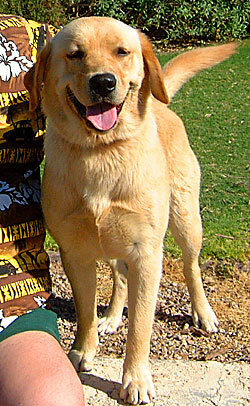 Sugar was born in April of 2012 to Luke and Marley, an off-Ranch Golden/Yellow dam from North Scottsdale. She has a smooth, uniform short coat and is tall, leggy, and lanky, with a vivid white blaze. With her soulful puppy eyes, she lives up to her name as a real sweetheart. She plays nicely for hours on end with all the older girls, and mastered our swimming pool at three months of age. She was an easy pup to train, seldom getting into any mischief, and quickly learning to ring the hanging "jingle bells" when she needs to go outside. Sugar exhibits amazing speed and agility, making her quite the scourge of small rodents and lizards as she sprints around the ranch property. Indoors, though, she's a calm, loving snuggle-buddy, just like her dad and grand-dad. All our adult dogs have been trained for obedience and snake avoidance, and have learned to communicate their needs and wants very effectively. Please phone (623) 640-7880 to arrange an advance viewing or get on our waiting list. Toby, Sweet Pea, and Kona —Three of Honey's pups at six weeks. 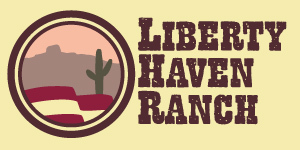 See our other ranch critters. E-mail us to get on our puppy waiting list.